THE HISTORY of what we today know as Helensburgh Parish Church began to emerge from the confused religious times of the 18th and early 19th centuries, during which religious affairs in Scotland were dominated by congregational splits. In 1822 a group of people began to worship together in Helensburgh, using a variety of locations over the next few years. Two years later land was acquired at the corner of Colquhoun Square where the present church now stands, and the first church building was opened in the following year under the name of the Original Secession Church. In 1839 the minister and congregation decided to join the Church of Scotland, and the building was then called Helensburgh Church. However this situation was not to last. In 1843 the Disruption took place when the Free Church of Scotland split from the Church of Scotland over the issue of patronage, which was the right of the local landowner to appoint the minister for the church. The Church of Scotland supported patronage, whereas the Free Church of Scotland believed that the congregation itself should decide on the appointment of a new minister. Throughout Scotland over a third of the ministers and a similar proportion of the active membership decided to detach themselves from the Church of Scotland and join the Free Church. Here in Helensburgh the congregation in Colquhoun Square opted for the Free Church of Scotland, and bought its church building from the Church of Scotland. Helensburgh's congregation now became known simply as the Free Church. Over the next ten years church attendance grew substantially, and so the decision was taken to build a larger church and demolish the old building. In 1851 a firm of Liverpool architects called JWH and JM Hay had won first prize for "A Country Church" at the Great Exhibition which had been held in the Crystal Palace in London. It is not known exactly how this firm of architects was chosen for the new church in Helensburgh. Perhaps someone from Helensburgh had visited the Great Exhibition and had liked the design. It is also worth noting that James Hay's father-in-law was a minister in Stirling called Dr Beith. Whatever the reason, the new building bore strong similarities to the prize-winning design shown at the Great Exhibition. The foundation stone for the new church was laid in February 1853 and seven months later the first service was held. Once again the congregation prospered, with the result that another Free Church with its own congregation and its own building (Park Free Church) was set up further east in the town; consequently the original Free Church was now renamed the West Free Church. Whereas the early history of the Church of Scotland had been marked by splits, the year 1900 saw a national union of the Free Church and the United Presbyterian Church to form the United Free Church, with the result that the building in Colquhoun Square now became known as the West United Free Church. 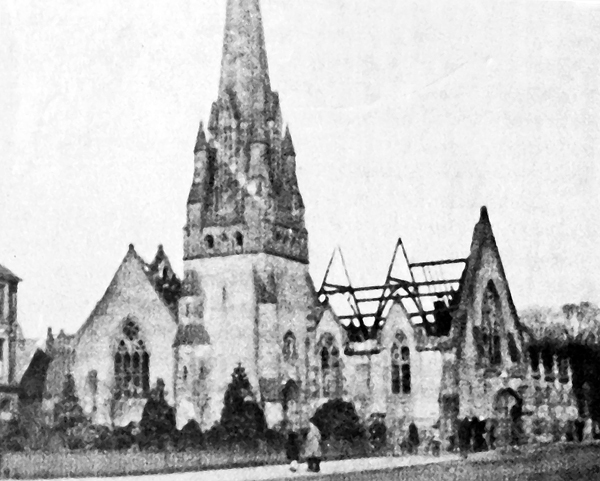 In 1924 the Church in Colquhoun Square was almost entirely destroyed by fire. However under local architect Robert Wemyss it was rebuilt with only minor differences and worship recommenced two years later. When it reopened Prime Minister Stanley Baldwin dedicated a new window above the east gallery of the church to the memory of Andrew Bonar Law who had served for six months as Prime Minister from 1922 to 1923, who had been Baldwin's predecessor as Prime Minister, and who had been a member of the congregation. 1929 saw a further national union taking place throughout Scotland, this time between the United Free Church and the Church of Scotland under the name of the latter. The result of this was yet another change of name for the Helensburgh church, this time to St Andrew's Church. This merger also meant that the breach created by the Disruption in 1843 was finally closed as far as Helensburgh was concerned. After the Second World War church attendance throughout Scotland began to decline, and it became obvious that Helensburgh could no longer support five Church of Scotland congregations. The first local union took place in 1956, when the Old Parish Church closed; as a result of this, St Andrew's Church became Old and St Andrew's Church. 1981 saw a union with St Bride's Church, and a change of name to the West Kirk of Helensburgh. A union with St Columba Church in 2011 led to the further new name of St Andrew's Kirk. The final union of Church of Scotland congregations in Helensburgh took place in 2015 when Park Church closed its doors. As a result the church building in Colquhoun Square became the last Church of Scotland in the town, and at this point it acquired its present name of Helensburgh Parish Church. Following the Disruption in 1843 there was nowhere in Helensburgh for members of the Church of Scotland to worship. Consequently in 1847 they opened their own church at the foot of Sinclair Street which from 1862 acquired the name of the Church and Parish of Helensburgh. The name was changed to Helensburgh Old Parish Church in 1929 following the national union of the United Free Church and the Church of Scotland. Although the church closed for worship in 1956 the Church of Scotland continued to operate it as a hostel for Royal Navy personnel from 1959 to 1968. Finally in the 1980s, after years of dereliction, the building was demolished, with the exception of its tower. Flats were built on the site, but the tower continues in use today under the name of The Clock Tower, partly as a gallery and partly as a source of tourist information. The first steps in the development of this church were taken in 1867, and the following year John Baird was appointed as a probationary minister. In the event he served this congregation for 42 years, and today he is famous as the father of John Logie Baird, the inventor of television. In 1869 the congregation built an iron church in William Street which was officially named the West Parish Church. As the congregation grew, a bigger building became necessary and in 1878 this was erected at the corner of West King Street and John Street. The name was changed to St Bride's Church in 1929 following the national union of the United Free Church and the Church of Scotland. This building closed for worship in 1981 and was demolished nine years later. Flats now occupy the corner part of the site and Helensburgh Library occupies the rest. Three stained-glass windows from the Church are on display in the Library, one of them commemorating the Rev John Baird. When the Original Secession Church decided to join the Church of Scotland in 1839, this was unacceptable to some members of the congregation who then left and worshipped in a variety of places over the next few years. In 1844 they acquired their own church at 2 West King Street under the United Secession Church, and their building became known as the Wee Kirk. In 1861 a bigger building was opened next door at the corner of Sinclair Street and West King Street, and the Wee Kirk became the church hall. In 1900 the name was changed to St Columba United Free Church following the national union between the Free Church and the United Presbyterian Church. The name became the simpler St Columba Church in 1929 following the national union of the United Free Church and the Church of Scotland. This church closed for worship in 2011. Today the church itself is called The Tower and functions as a digital arts centre, including a cinema, while it is planned to open a submarine museum in the church hall later in 2016. In the early 1860s the congregation at the Free Church in Colquhoun Square was becoming too big and so the decision was taken to build the East Free Church at the corner of Charlotte Street and East King Street. However a few months before the new building was opened in 1863 the congregation decided to change its name to Park Free Church, partly in acknowledgement of Sir James Colquhoun's recent gift of the Park in East King Street. The national union between the United Presbyterian Church and parts of the Free Church in 1900 meant that the church changed its name to Park United Free Church, and a further national union with the Church of Scotland in 1929 brought about another name change – this time to the simpler title of Park Church. By about 2010 Park Church, like many others in Scotland, faced the problems of attracting a new minister and maintaining its building, both in the face of adwindling congregation. Consequently it closed its doors to worship in 2015, but the following year the building was acquired by Buddhists who now use it as the Buddhist Meditation Centre of Scotland. 1822 – beginnings of the congregation. 1825 – first building opened in Colquhoun Square under the name of the Original Secession Church. 1839 – the Minister and congregation decide to join the Church of Scotland; it was then called Helensburgh Church. 1843 – following the Disruption, the minister and the congregation decide to join the Free Church of Scotland, with the building now simply being called the Free Church. 1853 – much larger new building erected on the site. 1862 – the church in Colquhoun Square is renamed the West Free Church as a second Free Church congregation and building (Park Free Church) had started further east in the town in that year. 1900 – following a national union of the Free Church and the United Presbyterian Church, the church in Colquhoun Square becomes the West United Free Church. 1924 – the building in Colquhoun Square is almost completely destroyed in a fire. 1926 – the rebuilt church opens for worship once more. 1929 – following the national union of the United Free Church and the Church of Scotland, the new name of St Andrew's Church is adopted. 1956 – The Old Parish Church, which is then closed, unites with St Andrew's Church and the church in the square becomes Old and St Andrew's Church. 1981 – St Bride's Church, which is then closed, unites with Old and St Andrew's, the building now taking the name of the West Kirk of Helensburgh. 2011 – St Columba Church, which is then closed, unites with the West Kirk and as a result the church in the square becomes St Andrew's Kirk. 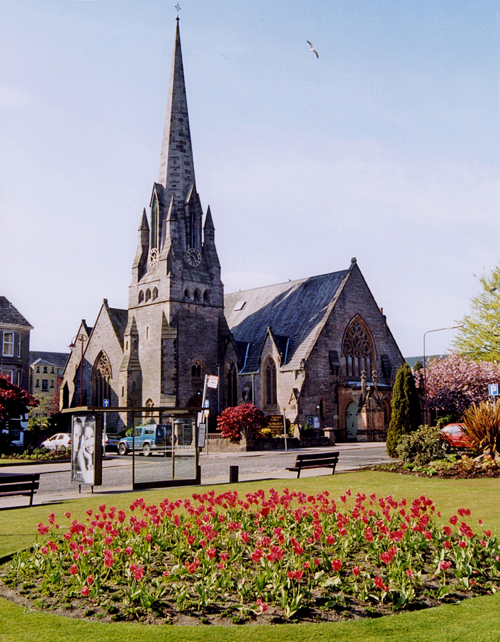 2015 – Park Church, which is the only other remaining Church of Scotland congregation in Helensburgh, and which is then closed, unites with St Andrew's Kirk and so there is a final name change to Helensburgh Parish Church.